And a couple of years ago I wrote a pretty good piece challenging Oxfam’s sensational report that claimed “obscene wealth” and inequality are “trapping hundreds of millions in poverty.” Here is a timely fusion of the two pieces as America seemingly plunges further toward socialism every day. Why is high CEO pay justifiable? “Top CEOs in America now earn, on average, over 300 times average pay. In 1965 it was 20 times. And folks wonder why there are populist uprisings of Left and Right.” So says Andrew Neil, the doyen of British journalism, and he has a point. That, though, cannot be the whole explanation. After all, we don’t object in principle to wealth differentials. Not even the best-paid CEOs earn as much as Cristiano Ronaldo or Floyd Mayweather, yet sports stars generally get adulation rather than envy. Is it, then, that we think CEOs are ripping us off? That doesn’t quite work either. For one thing, we are not being ripped off. We are richer, cleverer, healthier, cleaner, and even taller than any previous generation. In any case, unless we own their companies, we are not paying the CEOs a penny. The real claims on your wallet, as an American taxpayer, come from unfunded pension liabilities in the public sector, but no one is ever going to rage at retired firefighters. No, the obvious explanation for anti-CEO sentiment is that, unlike sportsmen or firefighters, their function is not immediately obvious to the layman. We know that they make decisions and sit in meetings and so forth. But we wonder how that can possibly be 300 times more valuable than the labor of their cleaners, drivers, or receptionists. Before I attempt the unpopular task of defending boardroom pay, it’s worth noting that the 300 figure is absurdly exaggerated. It is produced annually by the AFL-CIO and, as the brilliant Mark Perry keeps explaining, it relies on statistical chicanery. For example, it compares CEOs to all workers rather than just full-time workers — let alone full-time workers in their prime earning years. A like-with-like comparison would reduce the ratio to 177:1 (if we take mean CEO pay) or 104:1 (if we take the more meaningful median figure). Still, it’s a large differential. Are they worth it? One way to answer that question is to look at the impact that a CEO has on share value. By that measure, CEOs have indeed become vastly more important over the past half-century. When Burberry’s chief executive, Angela Ahrendts, announced her departure, it wiped $700 million off Burberry’s value. Conversely, when the unfortunate Steve Ballmer resigned from Microsoft, the firm’s value jumped by $25 billion. CEOs’ pay packages, vast as they are compared to yours and mine, are tiny when set next to figures like these. When a company is dealing with colossal sums, the difference between a moderately competent CEO and brilliant one is worth billions. The same is not true of drivers, cleaners, receptionists — or newspaper columnists. That, in a nutshell, is what dictates salaries. Why has CEO remuneration leaped since the 1960s? Because companies are larger and handle more cash. A small increase in the usefulness of the CEO translates into big increase in profits. At the same time, the global economy has become more integrated, meaning that there is wider international competition for the top jobs. You might feel that sitting in a boardroom is not intrinsically as valuable as, say, being a doctor. Fine. We can all have our opinions about what constitutes value. I’d love to live in a world where newspaper columnists are more valued than soccer stars. But, since we all have different views about what others deserve, there needs to be some way to aggregate our preferences. That is what the market does, setting our income, by and large, according to what others are prepared to pay for our services. It’s true for doctors and soccer players, and it’s true for CEOs. If you resent executive pay levels, here is a thought to console you. Almost no one grows up dreaming of sitting in a boardroom. It’s a fair bet that, when they were kids, most CEOs saw themselves as doctors or firefighters or soccer stars rather than as company directors. Their salaries reflect the fact that their jobs require competent and qualified people to do unglamorous things for long hours. They had to be, as it were, bought out from their original ambitions. And if they turn out not to be worth it? Well, they still cost you nothing. Creating value and thus wealth does not hurt the poor; it makes everyone else richer. And this fact has even been quantified by Yale economics professor William Nordhaus. He found that “most of the benefits of technological change are passed on to consumers rather than captured by producers.” His research for the National Bureau of Economic Research reported that innovators capture about 2 percent of the value they create and the other 98 percent of the value flows to consumers. There is little dispute that Walmart’s price reductions have benefited the 120 million American workers employed outside of the retail sector. Plausible estimates of the magnitude of the savings from Walmart are enormous – a total of $263 billion in 2004, or $2,329 per household. Sure, Sam Walton’s heirs are wealthy, about $100 billion between them, but consumers are receiving value of over $250 billion a year from that creation. So over 20 years we’ve received $5 trillion in value for the $100 billion kept by the Walton family, and that’s quite a deal. On a purely practical level, should we really care that great innovators keep 2 percent of what they create? Oxfam’s redistribution argument has been tried before and found wanting. It was the subject of the world’s largest economic experiment: the 20th century. Anyone surveying the rubble of central Europe from the Brandenburg Gate in 1989 knows that the taking and giving solution does not work. What is needed is the wealth creation strategy that we’ve been using in the period of free-market globalization ever since. 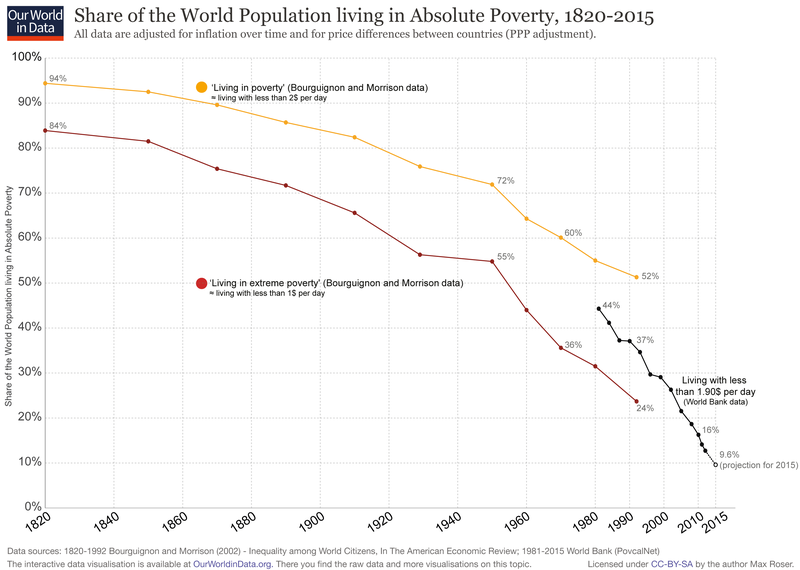 The last 100 years (or 50, or 25, take your pick) has seen the greatest reduction in poverty in human history (see the dramatic progress here). In 2015 68% of the world population had access to proper sanitation facilities compared to only 24% in 1980. 285,000 more people have gained access to safe water every day for the past 25 years. You don’t need to like the super-rich or decide if they are deserving, but you should recognize that most of them got there by making the rest of us richer, and not fall for off-base populist rhetoric that somehow blames them for trapping others in poverty.